I tried. I really did. I continue to do so, actually. After TheUnfathomableTruth’s beefylicious review of Five Guys, I went out there and yet again, got another burger. I’ve been trying for years to like them after everyone’s constant ravings and still, my heart belongs to another and my brain just cannot grasp the Five Guys love. I’m beginning to think there’s something wrong with me. Or maybe everything that’s wrong with me can be summed up in that conversation and scenario I had with H1 the Swan that one day in December two years ago when Five Guys was voted Best Burger in NYC. It went something like this: I raged on the streets that day. How was that possible?! I foamed at the mouth. I scoffed! I rolled my eyes! How? When there’s damned Shake Shack in this city?! I eventually calmed down as I am calming myself now to write this Shake Shack review for you, SnackTAYKrew! Sadly, I do not have a review this time of Shake Shack’s Shack burger, which is their standard fair (and the best, as far as I’m concerned). When I get one of those, it’s double patty business but as I said, I’m not here to talk about that this time around. I’m here to talk about bacon. For a while there, there was no bacon on a Shake Shack burger. Other than the fries, it was the one thing that drove a steak into my heart. I think I just used the wrong iteration of the word ‘stake’, but never you mind that. What you should be minding is the fact that I just said there was no bacon available on a burger. I think it’s safe to say that bacon makes everything taste better, and you should never believe what Sunny D commercials tell you. Ever. 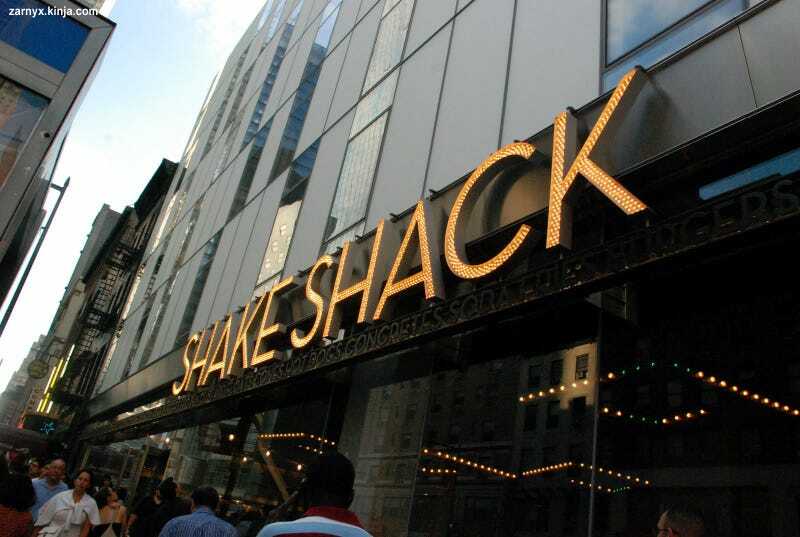 And then the day came in the-not-so-distant past that rumblings of bacon being available for Shake Shack burgers was a thing that was happening. Oh? Colour me very intrigued and tickled pink like the magical animal the pig. Well, it was only a few weeks ago after swooning over Damon Albarn, that I finally had the chance to try the Shake Shack Smokeshack - a burger that I never bothered to read what other toppings there are because all I saw was bacon and damn everything else lurking on it. Had I been paying attention I would have noticed that cherry peppers were all up in the fray and I may have reconsidered. I am a lover of spicy things but I went in wanting the taste of bacon, not the taste of things covering up my bacon and that’s partially what I found. I also found that the cherry peppers sort of covered up the amazing thing that is Shake Shack’s burger meat. There are a couple of things that make Shake Shack’s burgers great: the first being that their potato rolls are buttered. I don’t know why that should even be allowed but it is and it’s sinfully heavenly. Granted, I can see how this might be a turn off because coupled with the meat, this might all result in some greasiness that some may find off-putting. Surprisingly, this is the complaint I have of Five Guys - that it’s too greasy and heavy. The second thing is that meat with shack sauce. There’s mayo in there and a special blend in the sauce that is all secret and topped on an always juicy piece of meat. The secrecy makes me intrigued. What alien mysteries are hiding in there? Whatever it is, it’s advanced technology and I’m pretty sure its laden with mind controlling mechanics. Heh, sorry, that’s not very attractive but it tastes attractive, I can assure you. Let me tell you though, I was not disappointed by that first bite. The bacon hit me good, the cherry peppers weren’t as yet very overpowering and I tasted everything as the purest form of bliss imaginable - salty, smokey, bacony, beefy, mayonnaisey (it’s a word if it comes out of my mouth because I said it, didn’t I?). In between the first and last bite, everything in between was not as fortunate. The cherry peppers were way too plentiful but had a great pepper heat to them (no problem for me) but my precious burger taste became buried. And my bacon? It held on but I never got that sense of happiness until the final bite when I sadly looked at my bacon and made it a point to save a huge chunk of it at the end. You can have them as cheese fries too but even then they’re just not worth it to me. I’ve always said it and I’ll continue to say it, Shake Shack has some bad fries. I love crinkle cut fries so it pains me that these are just a sad excuse masquerading as potatoes. Five Guys wins for their fries, hands down. Shake Shack’s got a beautiful colour on theirs but forget colour, I want them to taste like they’re worthy of being in my presence. They never are. Every month, Shake Shack has a new Frozen Custard Calendar. That Sunday they had nothing of interest that I wanted. However, each location also has a special concrete which is a blend of their custard with whatever concoction they pander to our senses. I was at the Midtown location and on this day, my friend wanted me to choose. She and I had a brilliant adventure to Doughnut Plant one day three years ago (a place that while probably not touted as the best doughnut in the city, is pretty damned great in its own right and I’ll go back there one day to do a future SnackTAYku) and so, I decided to go with Jelly’s Last Donut for our concrete as it’s made with none other than a Jelly doughnut from Doughnut Plant. Mixed in with strawberry preserves (a bit of an overkill at times) and cinnamon, Jelly’s Last Donut can be a bit too sweet (a gross understatement if ever there was one). If they got rid of the preserves, I think it’d be better but it still does not disappoint if you’re looking for a good, creamy custard to eat up with pieces of amazing doughnut. I’m rather fond of it but in small doses. So that’s it, SnackTAYkrew. I did not get any good pictures of the Purple Cow (grape soda and vanilla custard) but that’s a yummy time as well. I do not see me switching any sides any time soon from Shake Shack and yeah, there are probably much better burger joints in this city but as far as a relatively cheap (and now branching out to other states! Woo!) yet not mundane burger goes - I’ll always go for a Shake Shack Shackburger. This Smokeshack may not get bitten into again though. What’s that? You want to visit TAY Classic? Yeah you should! Burgers, fries and shakes, oh my! No pie though. I’m sorry. TAY Classic is not a miracle worker for your pie needs. But for life, discussions on video games and anything else, you can go there for fun times all the time. Start a discussion or join up in one already going on! If you’re new and wanted to know how TAY works, then you should read TUT’s menu he created. Ask him to hold the cheese though. Trust me.